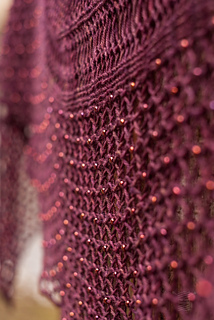 Fodhla is the second shawl in The Éire Collection. This collection of shawls celebrates the three sister Queens of Ireland. Fodhla is the romantic, lyrical sister who sings “Ireland” to you in her melodic voice and shows you her carefree, light and airy personality. Fodhla has an innate dreamy and ethereal quality to her that gives her such a romantic feel. Fodhla has beads woven in a gentle flowing manner throughout its length. The border widens out with gentle increases where garter stitch ridges rise up out of this border. The entire shawl crests in a point, and then flows back down with gentle decreases, until you are left once again with your beaded border. Fodhla’s true majesty is revealed once she is blocked, where she becomes a true Queen. Sample was worked at a gauge of 28 sts and 30 rows = 4” 10cm stockinette stitch using 4mm needles (unblocked). Please be aware any changes in gauge may affect your yardage and finished size. Fodhla is easily adaptable and this is explained in the pattern notes.